It looks like these delicate cookies belong in a pastry shop window. 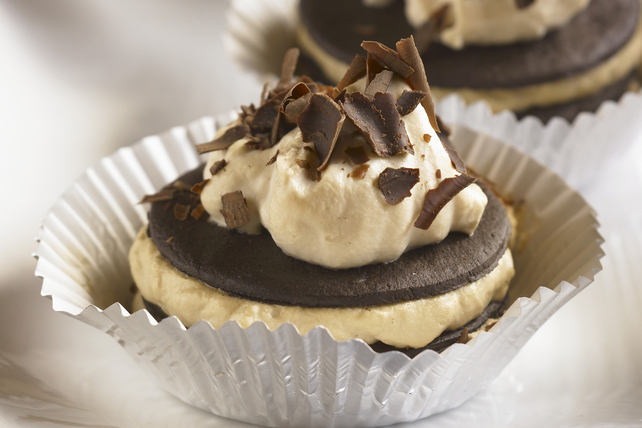 But these Layered Chocolate Cookies with Mocha Cream Filling are surprisingly easy to make. Beat pudding mix and coffee in medium bowl with whisk 2 min. Stir in Cool Whip. Place 1 cookie in each of 8 paper-lined muffin cups; top each with about 2 Tbsp. pudding mixture. Repeat layers twice. Top with shaved chocolate.